The Aero Wings, designed by multiple World IPSC Champion, Eric Grauffel, is the answer to fast retrievals of your pistol from any flat surface. Any serious competitor knows how important it is to be able to retrieve your pistol fast, grip it properly, and obtain your sight picture effectively. The Aero Wings are aerodynamically designed to improve the speed in which the pistol is lifted off any flat surface regardless of how it is positioned. You'll be able to retrieve it faster, while obtaining a better grip, resulting in a smoother sight acquisition. Perform like a Pro, with the help of The Aero Wings. 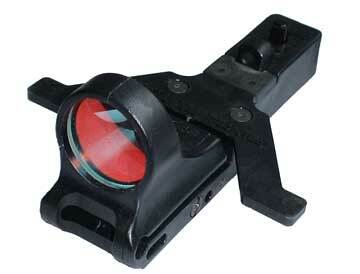 Designed to fit any C-More Red Dot Sight, The Aero Wings replace the battery cover on the sight. Made of strong, durable GF30 fiber reinforced polymer. The Aero Wings are available in solid black color only.